They may be worth millions, but as she examines the Crown Jewels the Queen could be any woman looking fondly at her jewellery box. Among the precious rubies and emeralds, diamonds and pearls that illuminate the history of our nation, she has her favourites and those… that are, quite frankly, a bit of a pain to wear. 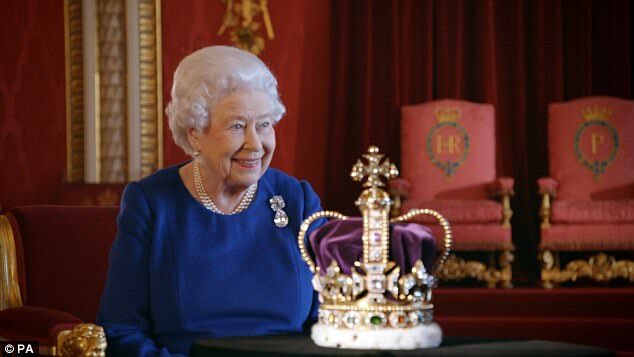 One is the ‘unwieldy’ Imperial State Crown, which the Queen confides is so heavy that in order not to ‘break my neck’ she is forced to bring her speeches up to her face to read them. 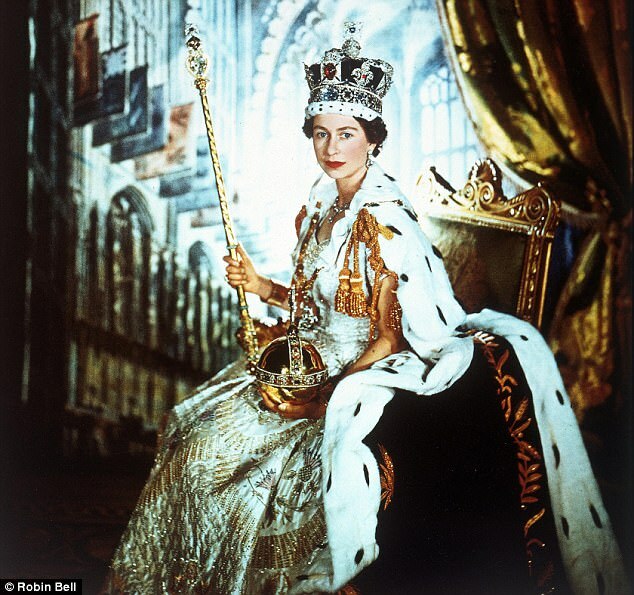 In a remarkably warm and chatty interview, she also reveals how, during her Coronation at Westminster Abbey in 1953, her elaborate gown got stuck on the carpet pile and for a moment she wasn’t able to move. She is at her sparkling best, relaxed and full of gems of information about the treasures that are hers to show off. The programme is the fruit of a collaboration between the BBC and The Royal Collection Trust, guardian of more than a million antiques and works of art on behalf of the nation, which tells the stories of some of its greatest treasures in a series of programmes over the next few weeks. Unusually, to mark the 65th anniversary in June of her Coronation, the Queen agreed to appear on camera at Buckingham Palace with a selection of her Crown Jewels. The treasures were brought from the Tower of London to be filmed as she reminisced with royal commentator Alastair Bruce. Faced with her diamond encrusted Imperial State Crown, which she wore at the end of her Coronation and until recently used for most State Openings of Parliament, the Queen has an almost comically hostile expression as she unexpectedly pulls it towards her. Mr Bruce notes that it was ‘huge’ when her father was crowned. The Queen replies: ‘Yes. Very unwieldy.’ She adds: ‘Fortunately my father and I have about the same sort of shaped head. But once you put it on it stays. I mean it just remains on.’ Asked if she has to keep her head very still while wearing the 2lb 5oz crown, the Queen replies: ‘Yes. And you can’t look down to read the speech you have to take the speech up. The Queen, who was 27 when she was crowned, is also shown nonchalantly flicking four pearls hanging underneath the arches of the crown. 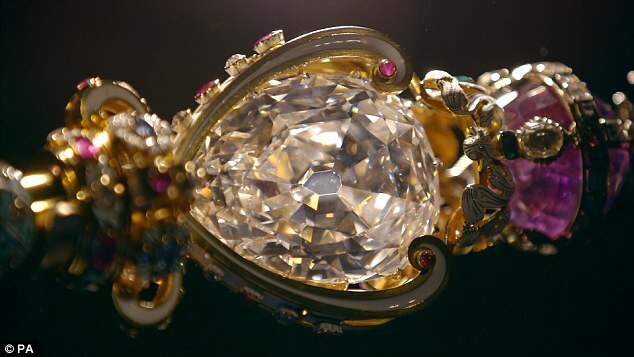 Two of the pearls are said to have belonged to Mary Queen of Scots and to have been bought by Elizabeth I. The Queen says with a sad laugh: ‘They were meant to be Queen Elizabeth’s earrings. But they’re not very happy now. They don’t look very happy now. The documentary also features the St Edward’s Crown, which the Archbishop of Canterbury placed on her head at the moment of coronation. 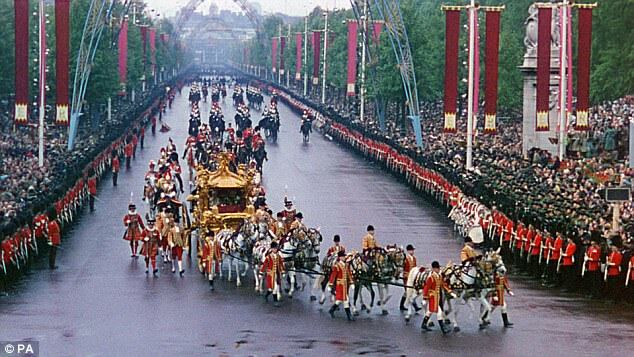 The Queen sees footage of the Coronation featuring her golden state coach, which weighs nearly four tons. 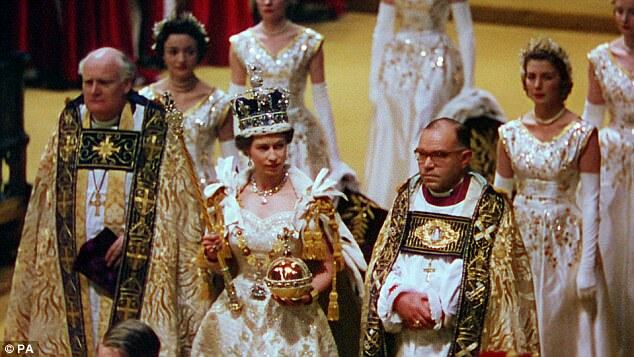 Inside the Abbey, with the eyes of the world on her, the Queen is seen in her coronation dress, embroidered in silk with pearls, and gold and silver bullion thread. Many of the Crown Jewels were buried in a biscuit tin under Windsor Castle during the Second World War to stop them being seized by the Nazis, it has emerged. They were placed inside a Bath Oliver tin like the one on the right and lowered into a hole dug beneath a castle entrance. Grass was then left to grow over the hiding place to conceal it, according to recently discovered letters. It was such a closely-guarded secret that the Queen herself only found out where the jewels had been hidden during the filming of the documentary. A young Prince Charles and Princess Anne can also be seen playing underneath the train of her purple velvet robe. ‘Such fun for the children,’ the interviewer says. ‘Not what they’re meant to do,’ the Queen says with mock sternness. 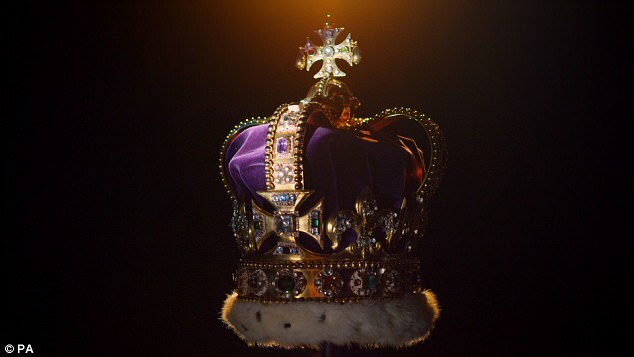 One of the most eyecatching stones int he Imperial State Crown - and clearly the Queen's favourite - is the Black Prince Ruby's. 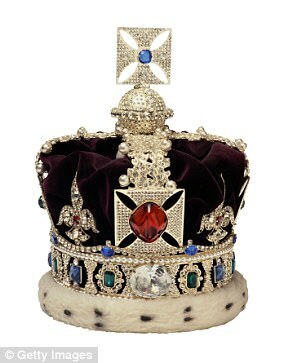 The 170 stone, which is actually a semi-precious spinel, is mounted at the front of the crown. It is thought to have been given to Edward, Prince of Wales, known as the Black Prince who died in 1376. In 1415 it was worn by Henry V in his helmet at the Battle of Agincourt. He is supposed to have had a hole drilled in the ruby and a feather placed in it.